SINGAPORE - Water in MRT tunnels from Bishan to Braddell stations disrupted train services along 13 stations on the North-South Line for several hours on Saturday (Oct 7). 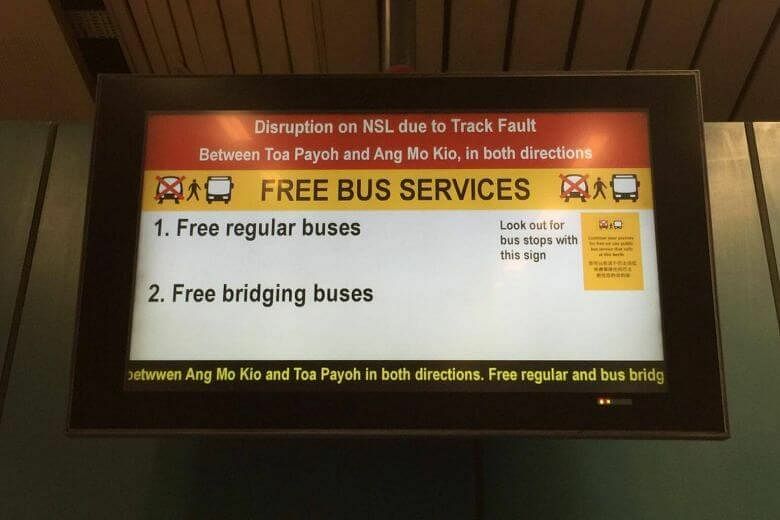 Train services between Newton and Marina South Pier were restored at 9.22pm, almost four hours after SMRT's first alert on the disrupted services. However, at 10.45pm, SMRT said services between Ang Mo Kio and Newton will not be resumed on Saturday. 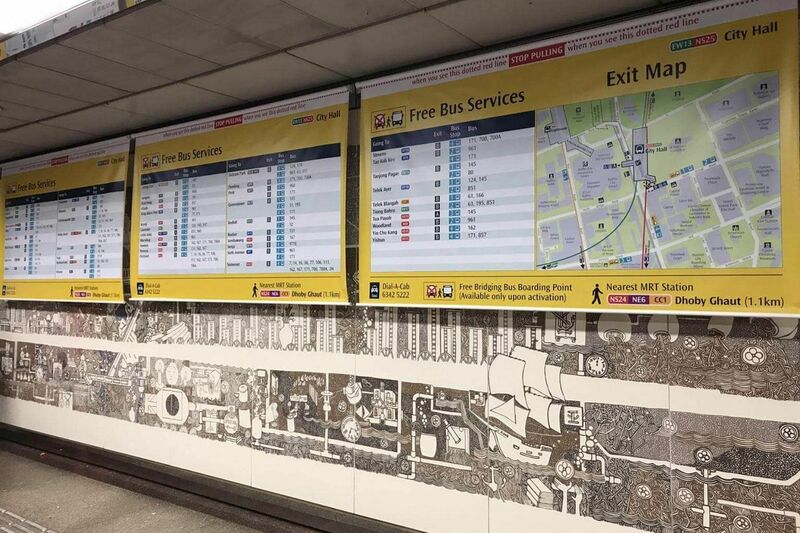 SMRT was working to resume services on Sunday, the train operator said in a tweet and on Facebook. It will carry out network-wide tunnel checks throughout the night, it said. The Singapore Civil Defence Force (SCDF) said it received a call from SMRT at 7.07pm about flooding in the tunnel between Braddell and Bishan MRT stations. 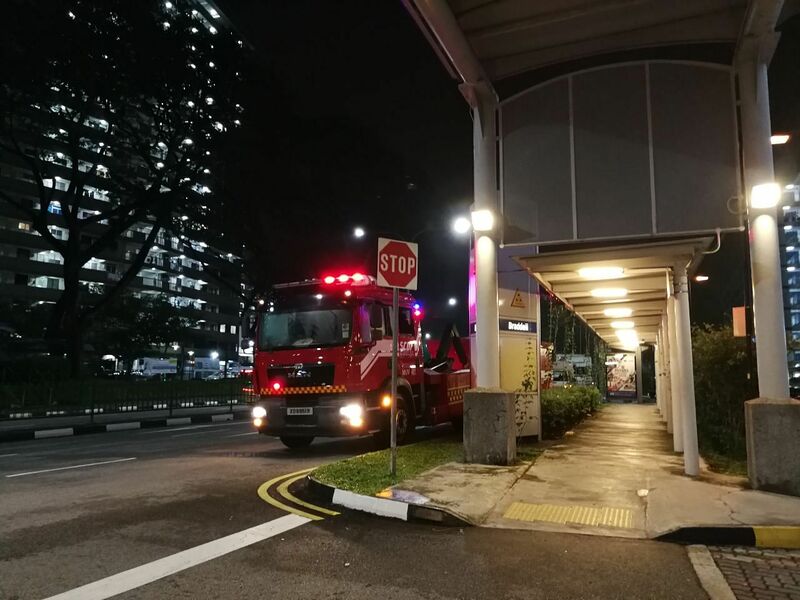 In an update close to midnight on Saturday, SCDF said it is using portable pumps to siphon water from the affected area in what is expected to be prolonged operation. The disruption comes as the National Environment Agency issued warnings of heavy rain with gusty winds over many parts of Singapore on Saturday. Water in the tunnels went up to more than 30cm, The Straits Times understands. There have been previous cases of water entering MRT tunnels, however, this is believed to be the first time it has affected train service. Water got into the tunnels despite flood prevention measures having been improved recently, The Straits Times understands. Bus bridging services have been activated. Separately, a fire was spotted in a tunnel between Marina Bay and Raffles Place stations. It has since been put out. It is not clear if it is linked to the flood, although electrical short circuits caused by water had sparked tunnel fires before. SMRT said the "small fire" was spotted by a train captain at 5.55pm. SCDF was alerted and it deployed assets to Marina Bay station. "However, the fire had died out by itself," said SMRT in its Facebook post. SCDF told ST that it received a call from SMRT around 5.55pm about the fire. The fire burned itself out prior to SCDF's arrival, a spokesman said. There were no reported injuries. Engineers were on site and investigating both incidents, said SMRT in its update on Facebook at around 7.32pm. 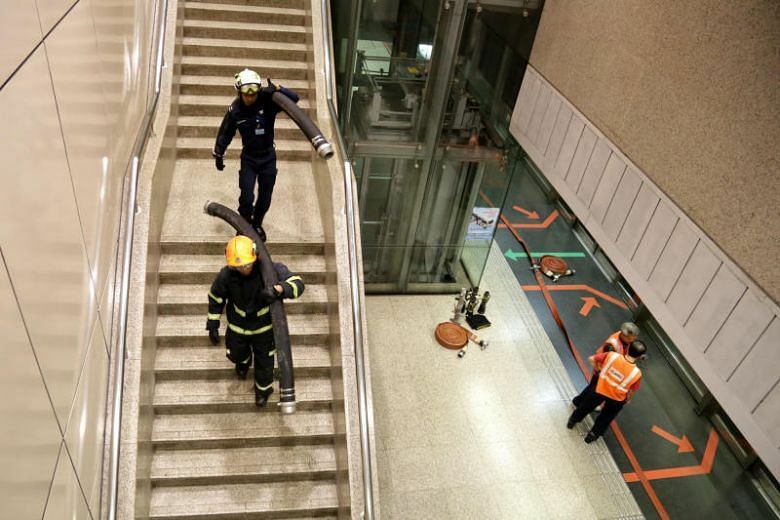 At around 8.30pm, SCDF and PUB officers were seen at Braddell MRT carrying hosereels into the station. MRT tunnels are equipped with pumps which will kick in when tunnels are flooded. It is not known why they could not cope with the water on Saturday. SMRT first sent an alert about the disruption in a tweet at 5.36pm. It said there was no train service between Bishan and Toa Payoh stations towards Marina South Pier "due to a track fault". At 6.05pm, it updated that train services were not available between Ang Mo Kio and Marina South Pier. [NSL] UPDATE: No train svc btwn #AngMoKio and #MarinaSouthPier. Pls consider alternative transport. askST: What measures are taken to protect underground MRT stations from flash floods? Marketing manager P. Pang, 45, told ST that he boarded the train at Yio Chu Kang MRT at 5.37pm. “The train was stuck at the station for quite a while. When I checked SMRT twitter and realised there was a track fault, I got off at Ang Mo Kio. But people were still boarding the train, as there was no instructions asking them not to,” he said. Sales executive Imelda Tan, 51, was at City Hall MRT when she was instructed to take the Circle Line to Bishan instead and catch a bus from there to her home in Braddell. “I was at Esplanade and walked to City Hall. I was about to tap in but then saw there was a large crowd outside. 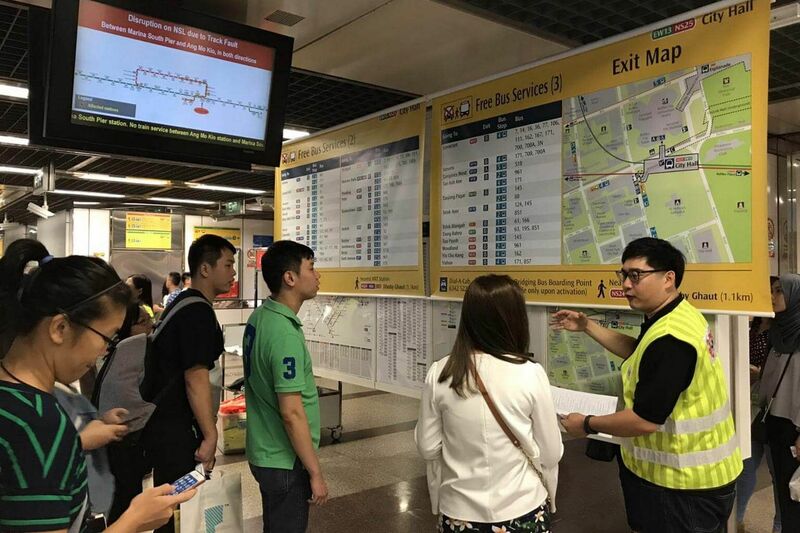 I had no idea what the problem was, so I asked the staff and have found out that I need to go all the way back to Esplanade and take the Circle Line back to Bishan,” she told ST.
Commodity manager Tan Yean Shi, who lives in Yishun, said directions from SMRT staff were helpful. "There were people inside the station, and outside. It’s not bad, they’re quite helpful. But I think that now I won’t be able to get home even after an hour with this traffic jam,” the 33-year-old said. Meanwhile, Uber Singapore said it was suspending surge pricing. "Uber is working with the LTA to assist with the MRT service disruption between Ang Mo Kio and Marina South Pier. We will temporarily suspend dynamic pricing and encourage more drivers to go online to provide commuters another choice for transportation," a spokesman said. In 2006, heavy rain in the morning, left the Novena station with water-logged floors and a dripping ceiling. The water, which rose to a height of 5cm, seemed to have come from a nearby construction site. 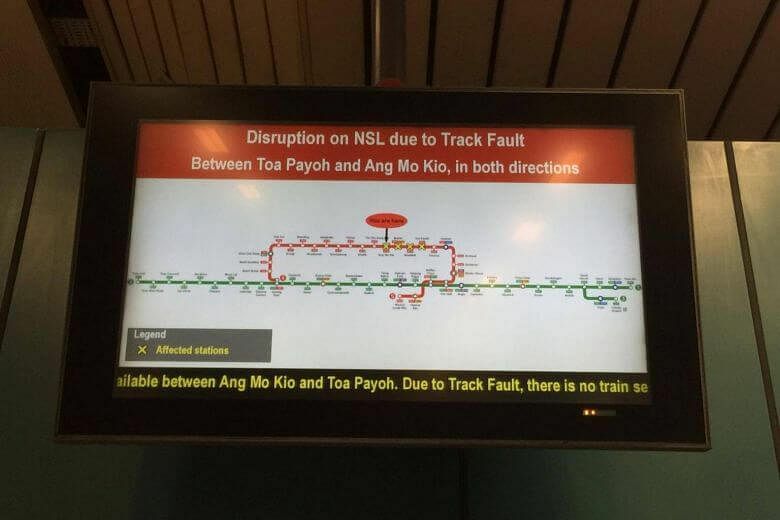 The North-East line too was disrupted on Saturday due to a train fault. In a tweet at 12.39pm, train operator SBS Transit said service towards Punggol station was delayed due to a train fault at Sengkang station. Train service resumed about 20 minutes later.